It was that time of the year again – City 2 Surf! After a couple of cold and wet months of training we were hoping for a dry Sunday (especially I was looking forward to some more sunshine, having just returned from a hot and sunny Darwin the night before). Well, I got told I missed some really bad weather and should be grateful that there is no rain. This year Ben ended up with an orange bib, meaning we had to start at the very end of the race in the ‘Back of the Pack’. Not an ideal situation and quite different to the un-obstructed start we enjoyed last year following the first red group. The only great thing about an orange bib was the late start. Ben and I could sleep in and watch the start of our race on TV at home – how cool was that! The City 2 Surf in Sydney is now the biggest run in the world with over 85,000 runners and walkers registered. To get such a huge number safely to Bondi, the start is staggered between 8am and 9.30am and yes, you guessed it – Ben and I started at 9.30am this year. So long after the winner (41 minutes for 14km) was back home, showered and dressed, we left our home and took a bus to the start line. We managed to get into the very front of the orange group, which allowed us to have a clear run for the first few hundred meters before hitting the back of the yellow group which started 30 minutes ahead of us! It was a hard run, especially for Ben. Not only was the strong and cold wind quite uncomfortable at the beginning, the mass of slower runners and walkers in front of us were a real challenge, as we had to navigate around them for the entire 14km all the way to the finish. Sometimes I had to push Ben to the right and dart around the left to meet up with him again after overtaking slow people. Sometimes I took his hand and had to pull him with me to the left to avoid dripping over runners in front of us. We did stumble a few times into other people, mostly runners with headphones who could not hear us coming. We probably ran more like 15km or 16km to Bondi weaving from left to right and right to left along the entire course. I am sure Ben must have felt seasick at the end of it. The drink stations were another challenge for us simply getting to the tables staying together and not loosing each other in the process but also not slipping on those wet discarded cups along the way. Paper cups are far more ‘dangerous’ for people like Ben than the previously used plastic cups. Last year Ben and I finished the race in 87 minutes starting right after the red group and having a fairly clear run to Bondi. We got overtaken by 20,000 faster runners in the process and finished 27,000 out of 68,000 participants. This year Ben and I arrived in Bondi after 89 minutes having started behind 60,000 people and having overtaken at least 30,000 slower runners along the way, and we finished in almost the same position, ranking 30,600 out of 65,000 finishers. Congratulations to Ben for an extremely good run under quite difficult and odd circumstances. 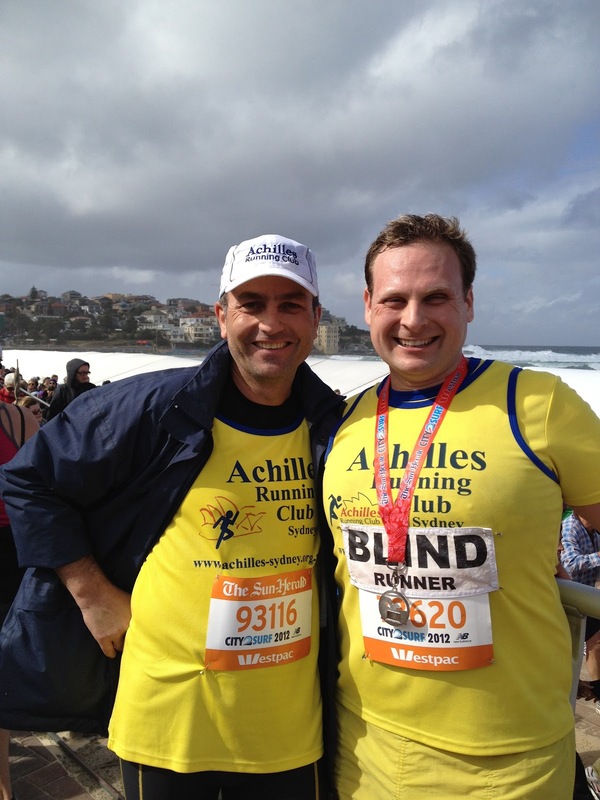 This entry was posted in Updates and tagged achilles club, ben, racing, sydney by run4vision. Bookmark the permalink.